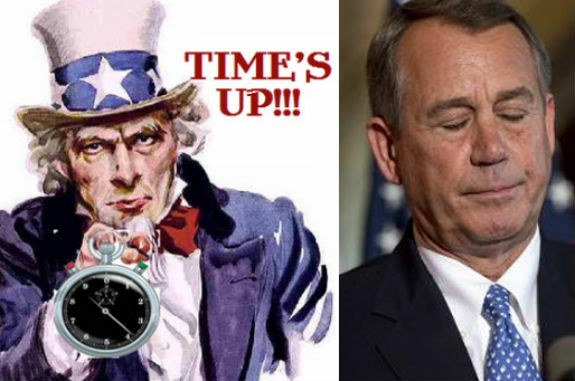 How About Term Limits For Speaker? Right after the 2010 Tea Party wave election our colleague Mark Fitzgibbons suggested that there ought to be terms limits for Speaker of the House. Sadly, the incoming House Republican majority has accomplished few if any of the policy changes voters clamored for in 2010 and certainly none of the structural and institutional changes that would be a disincentive to the institutional corruption that continues to plague the House. The House leadership appears to many Americans to be a closed elite that, even when its second ranking leader was defeated for renomination, remains cut-off from the conservative grassroots of the Republican Party and impervious to calls for opening the leadership to younger leaders more representative of the limited government constitutional conservative base of the GOP. One result of this closed leadership is that House Speaker John Boehner is now the overall most unpopular leader in Congress, surpassing even House Democratic Leader Nancy Pelosi who has long held that title. Boehner was viewed “very favorably” by just 4% of those surveyed in a Rasmussen Reports national telephone survey while he was viewed “very unfavorably” by some 30% of a national survey of 1,000 “Likely Voters” conducted on May 27-28, 2014. While the courts have so-far found congressional term limits to be unconstitutional, under Article I of the Constitution, the House is empowered to make its own rules and it could establish a rule that a Speaker may serve no more than four years in that role. As Fitzgibbons pointed out back in 2010, “John Boehner was a Newt Gingrich lieutenant who fought for institutional changes that Gingrich wanted in his 1994 revolution. He could put his name into the history books in many ways, but perhaps his single biggest contribution would be to implement the institutional changes needed to foster better policy in the long run.